Custom tabs lend credence to your important message. Presentation is everything. Become the star to your end user client. Custom printed tabs add that pivotal point to your professional presentation featuring index tabs. You will supply the title of each index tab. Crane customer service can guide you through this process. Review the proof copies we send to you. Each element is important in implementing organization protocols and sales image. Mylar color for each tab, drill hole size and pattern 3 hole, 5 hole reinforcing on binding edge, index tab collation sequence. All custom index tabs including price per index tab set are included on the proof copy your written approval. 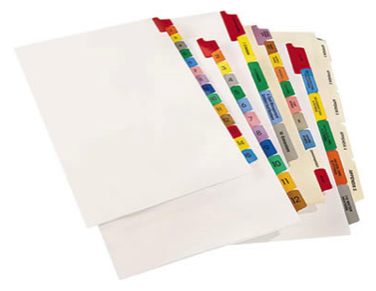 Once you fax or email signed index tab proof back standard turn around time for custom printed tabs in 7-10 work days. How quickly do you need index tabs?